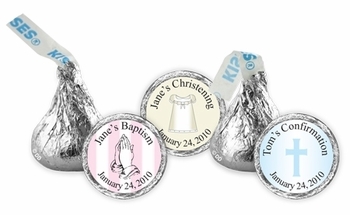 These Hershey��s Kisses are terrific personalized chocolate favors for Christenings, Baptisms or any other religious event! Choose from 20 beautiful religious themed designs to personalize the labels that will be applied on each tasty treat! Suggested quantity per guest: 5-10 Kisses. Depending on the weather and to prevent melting, all orders for chocolate favors may have to be shipped 1 or 2 Day Air once the order has been processed (usually in five to seven business days). In other words, orders placed today will NOT be received tomorrow, as time must be allowed for processing.